US Dollar: Sept. USD is Down at 93.935. Energies: Oct '18 Crude is Up at 69.04. Financials: The Dec 30 year bond is Down 8 ticks and trading at 142.04. Please note the current month is December, 2018. 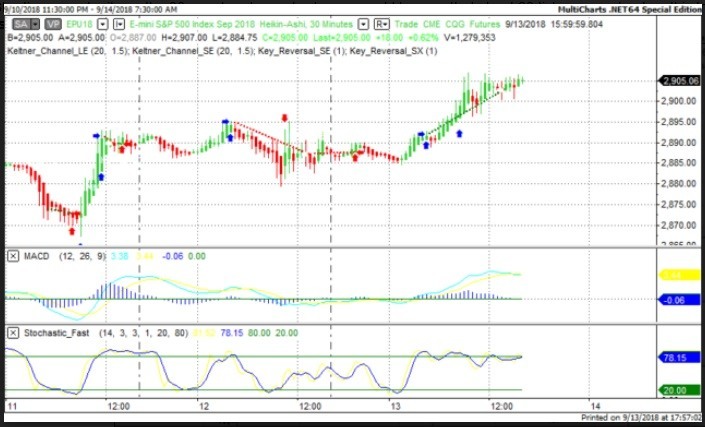 Indices: The Sept S&P 500 emini ES contract is 12 ticks Higher and trading at 2891.50. Gold: The Dec Gold contract is trading Up at 1213.20. Gold is 50 ticks Higher than its close. This is not a correlated market. The dollar is Down- and Crude is Up+ which is normal and the 30 year Bond is trading Lower. The Financials should always correlate with the US dollar such that if the dollar is lower then bonds should follow and vice-versa. The S&P is Higher and Crude is trading Higher which is not correlated. Gold is trading Up+ which is correlated with the US dollar trading Lower. I tend to believe that Gold has an inverse relationship with the US Dollar as when the US Dollar is down, Gold tends to rise in value and vice-versa. Think of it as a seesaw, when one is up the other should be down. I point this out to you to make you aware that when we don't have a correlated market, it means something is wrong. As traders you need to be aware of this and proceed with your eyes wide open. At this hour all of Asia is trading Higher with the exception of the Shanghai exchange which is fractionally Lower at this time. Currently all of Europe is trading Higher. Import Prices m/m is out at 8:30 AM EST. This is major. Capacity Utilization Rate is out at 9:15 AM EST. This is major. Industrial Production is out at 9:15 AM EST. This is major. Prelim UoM Consumer Sentiment is out at 10 AM. This is major. Business Inventories m/m is out at 10 AM EST. This is major. Prelim UoM Inflation Expectations is out at 10 AM. This is major. Yesterday the ZB made it's move at around 8:30 AM EST. The ZB hit a High at around that time and the YM hit a Low. If you look at the charts below ZB gave a signal at around 8:30 AM EST and the YM was moving Higher at the same time. Look at the charts below and you'll see a pattern for both assets. ZB hit a High at around 8:30 AM and the YM was moving Higher at the same time. These charts represent the newest version of MultiCharts and I've changed the timeframe to a 30 minute chart to display better. This represented a Shorting opportunity on the 30 year bond, as a trader you could have netted about 20 ticks per contract on this trade. Each tick is worth $31.25. Yesterday we gave the markets an Upside bias and the markets didn't disappoint. The Dow rose by 147 points and the other indices gained ground as well. Today we aren't dealing with a correlated market however our bias is to the Upside. It looks as though the economic news reported yesterday helped to boost the markets as the indices gained ground. 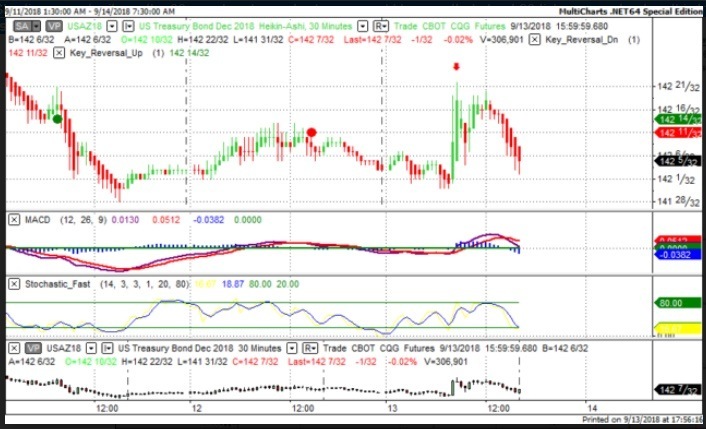 Unemployment Claims were down and the CPI and Core CPI rose less than expected and this led the markets to believe that perhaps the Fed won't raise rates any time soon. But as in all things only time will tell. On Thursday, April 5th we had the honor and privilege to be interviewed by David Lincoln on his You Tube channel. David is a floor trader for the options markets. If you listen to this interview, you will enjoy it.